Apr 01 2017: Surfs up, Japan! 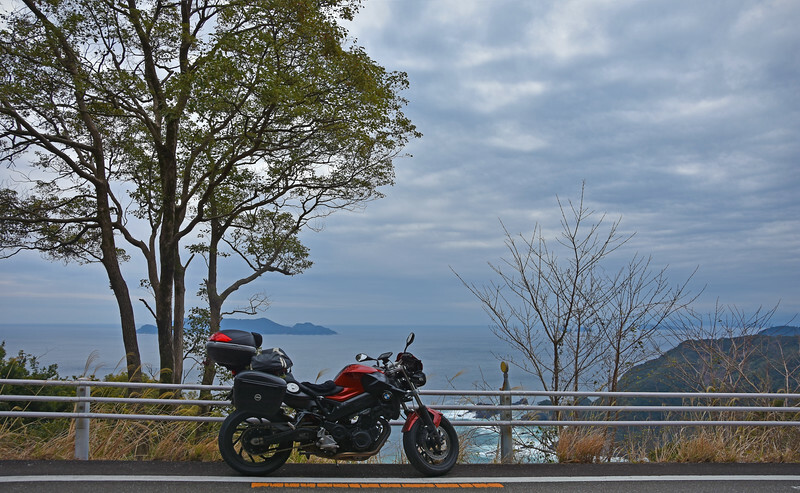 We're riding the island of Shikoku today. 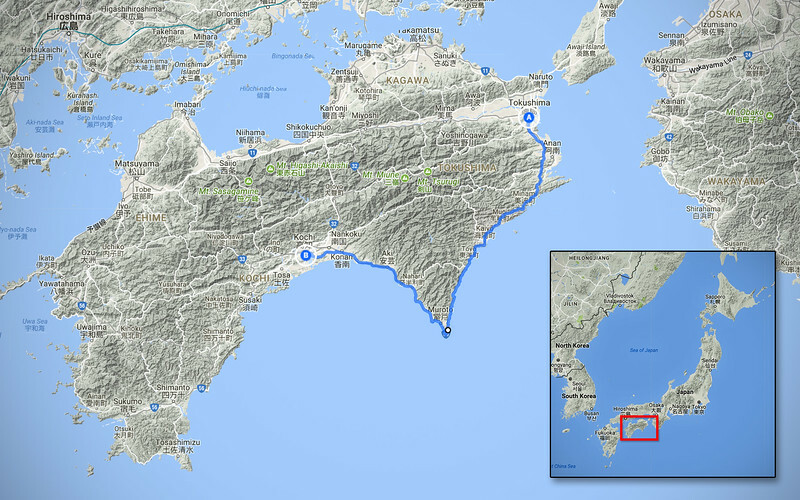 The plan is to simply follow the coastline south-west from Tokushima and just check out what's along the way. A little shortcut through the mountains. 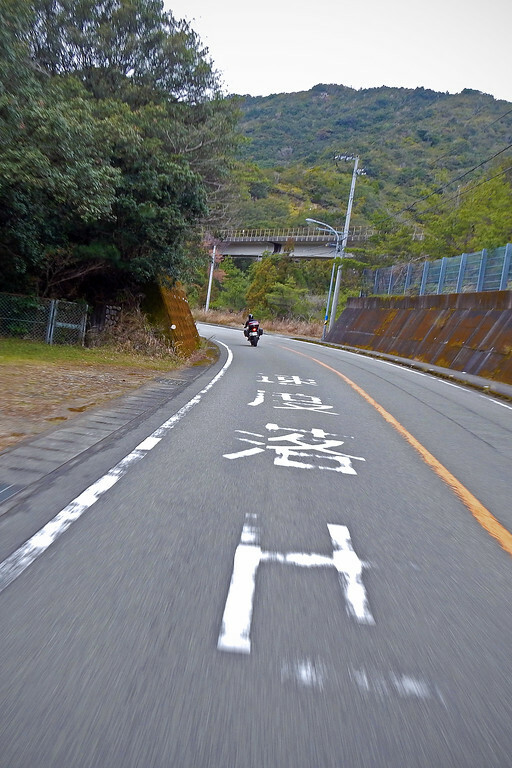 Virtually no traffic once we're outside of Tokushima! We like that. It's still pretty cold and overcast as we break through the heavily forested mountains. 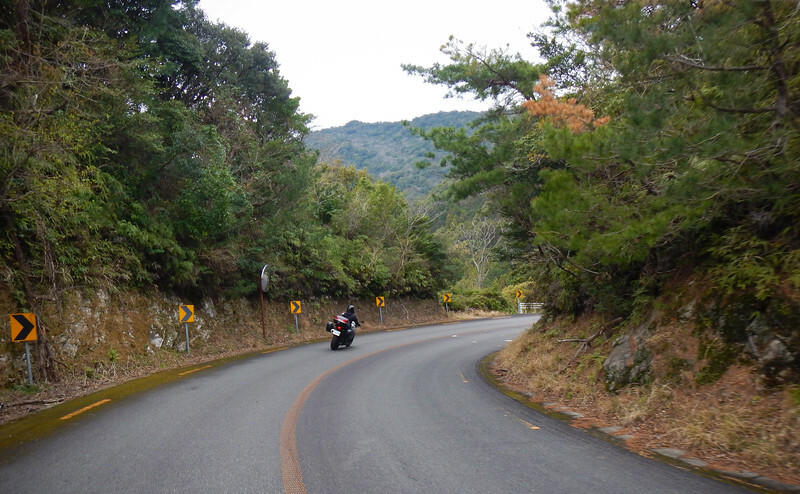 The twisty road we're on quickly descends down to Shikoku island's shores. We're greeted by the sight of sandy beaches along the coastal route. These hikers are actually on the Shikoku 88 Temple Pilgrimage. 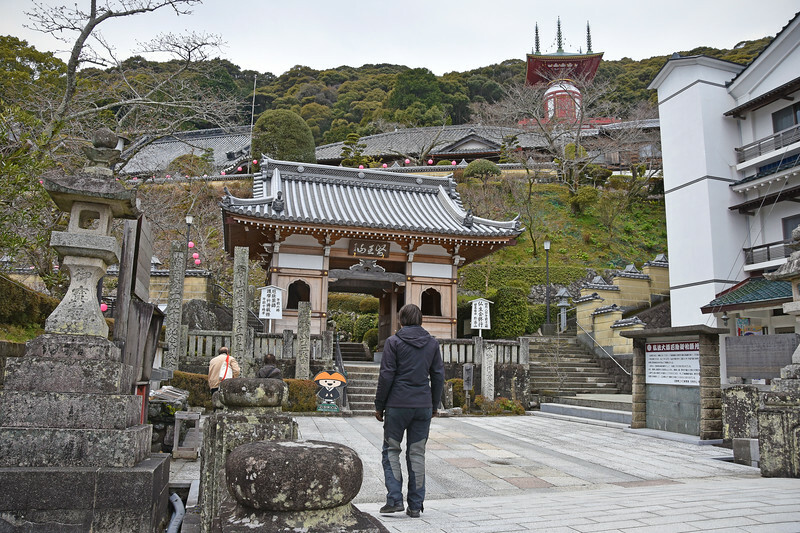 There are 88 temples scattered all around the island of Shikoku. Pilgrims have to visit all of them in order, traveling a total of 1,200 kms! To show your progress, you get your Temple Stamp Book marked with a red stamp found at each temple. So it's like a religious scavenger hunt! People from outside Japan may not be aware, but there is a bit of fad going on with these Goshuin (temple stamp books) in Japan these days. 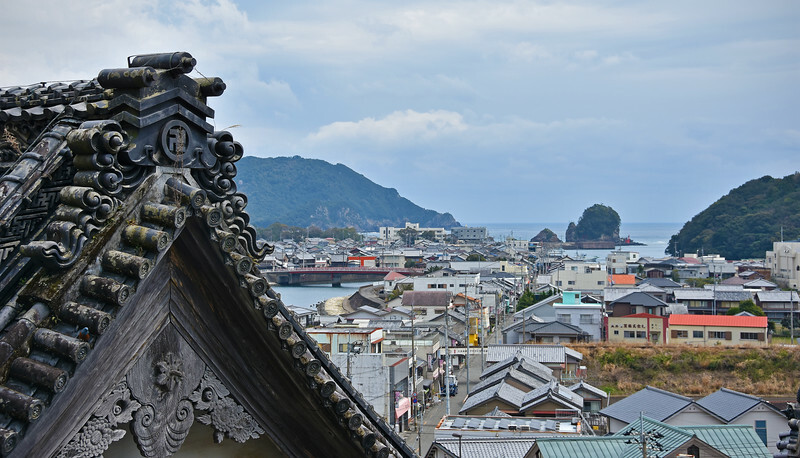 Temple stamps can be found all over the country, not just on Shikoku. We're on a lot of Japanese Facebook groups, and we've seen so many posts of people's goshuin showing off rare stamps from hard-to-reach temples. For a lot of young people here, if you're going on vacation or on a business trip to a different part of Japan, you must always make time to visit one of the temples in the area to get your goshuin stamped there, so you can post a picture of it on Facebook, to the envy of everyone else! 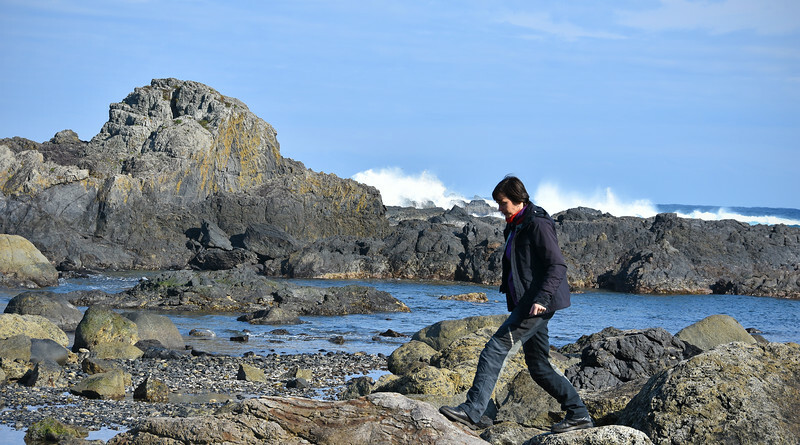 Since the pilgrimage can be done any time of the year, early spring is probably the best time to undertake it, as the weather hasn't gotten too hot yet on the island, and the snow is already disappearing from the mountains. On our southern route down the east coast of the island, we pass throgh Minami, where we spot a large temple from the road. This turns out to be Yakuoji temple. 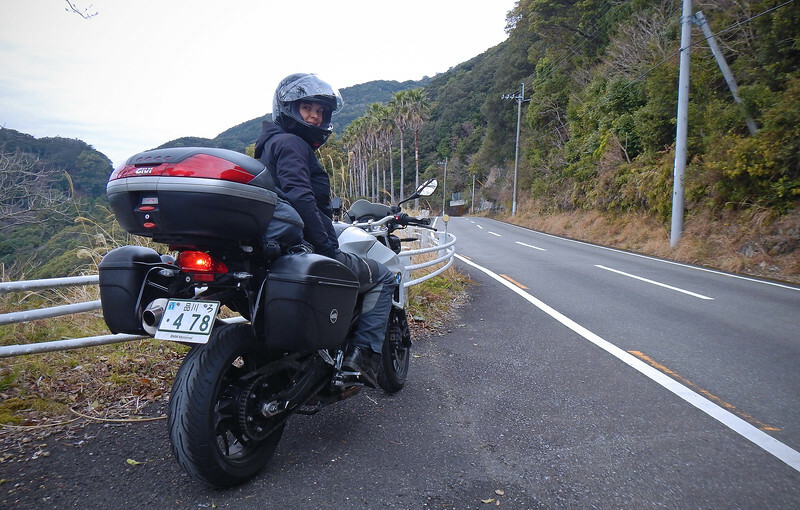 It's #23 on the Shikoku 88. We stop to investigate. At the temple in Minami, we see the cartoon sign for food, the mascot with the noodle bowl on his head. Must be a restaurant inside? No restaurant. And embarassingly, I find out that it's not a sign for food at all. The cartoon figure is actually Koya-Kun, a monk who is the mascot for the town of Koya, which we visited a day earlier. 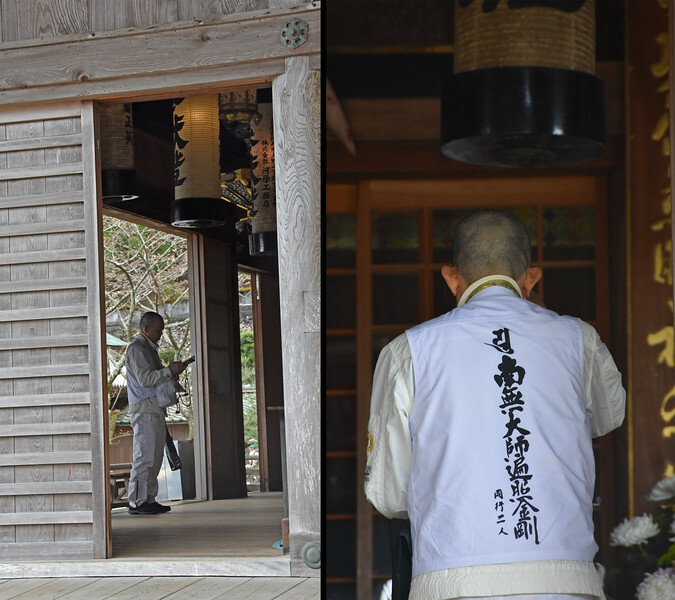 The reason the Shikoku 88 pilgrims were in Koya, was because that is where everyone traditionally goes to prepare for the trek. 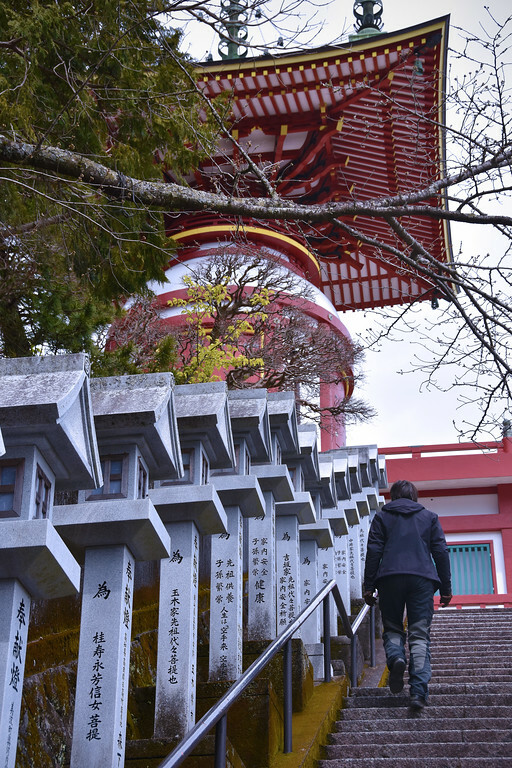 At Yukuoki, there is a local custom where people visiting the temple leave coins on the steps just beside the railing for good luck. I haven't seen that in any other temple. Koi is Japanese for carp. Typically carp is grey in colour, but when it was first brought over to Japan, breeders brought out various bright colours in the fish. The koi fish are a symbol for love and friendship because "koi" also sounds like the word for "love" in Japanese. Aha, we spy the first Cherry Blossoms! Neda is sooo happy we are finally seeing them start to bloom! I have no idea what it says, but it's a constant reminder that we are in Japan! Japan has a long history of earthquakes and tsunamis. The last big earthquake/tsunami was in 2011, and that one caused the Fukushima reactor meltdown. During that disaster, a 30-meter tidal wave of black water slammed the north-east coast, killing 18,000 people. Since then, many countermeasures have been put in place to prepare for the next big earthquake and/or tsunami. Vast underground tunnels have been carved beneath Tokyo to allow the flood waters to drain. In the coastal areas, these ramped tsunami evacuation towers allow people to climb high enough to avoid killer tidal waves and being drowned in the resulting floods. 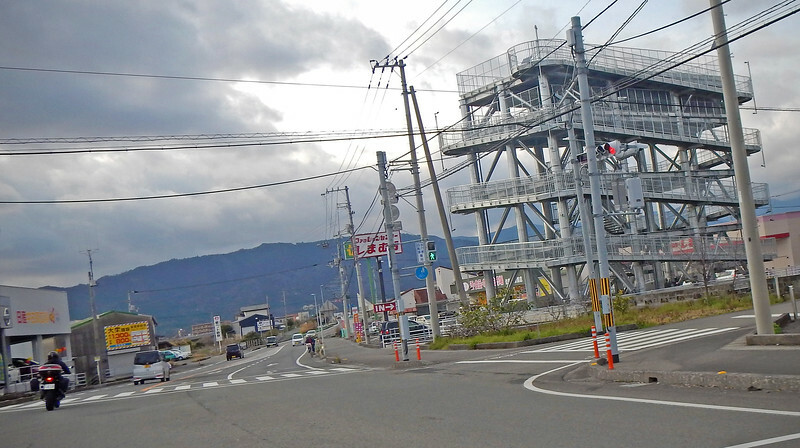 There were about 4 or 5 of these mega structures in each town we passed through. Crazy! It's a monkey! A Japanese macaque, specifically. We stare at them up in the trees. They stare back at us. This one has a tree growing on top of it! Cool! This lady walking by us was funny. 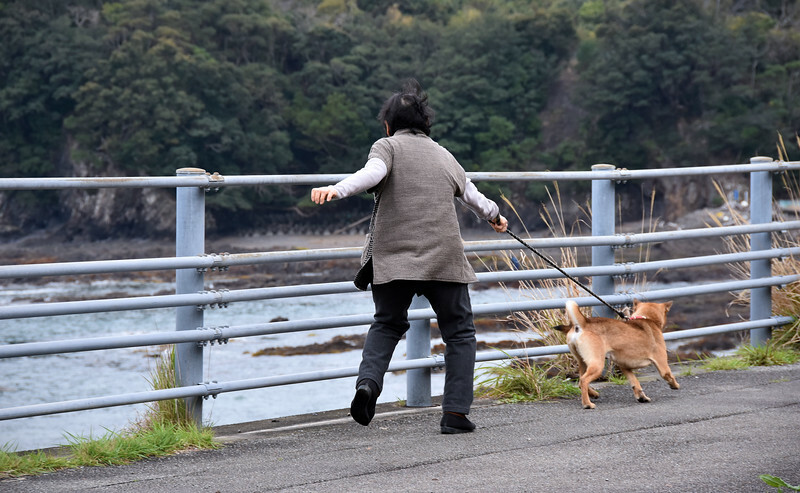 She had no control over her dog. It was walking her! Laughing out loud, Neda says to me, "Our dog is *never* going to behave like that!" A bit further down the road, we see people in the waters. Not just any people... surfers! 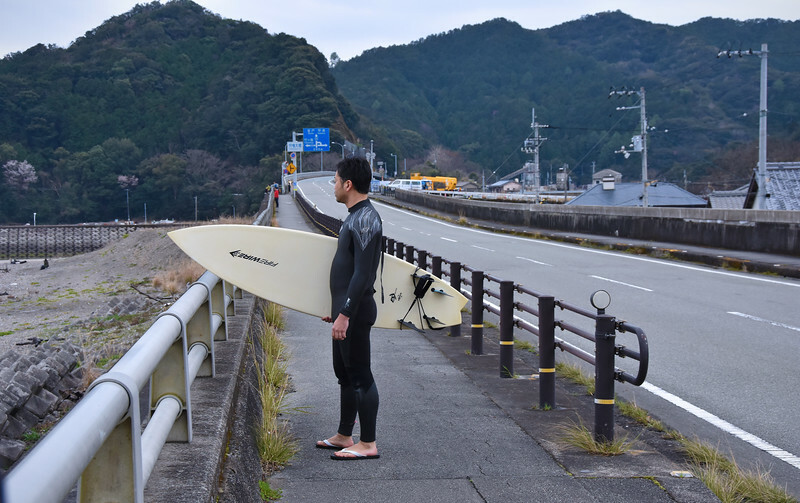 I'm not a big surfer, but I've never heard of Japan being a great surf spot. 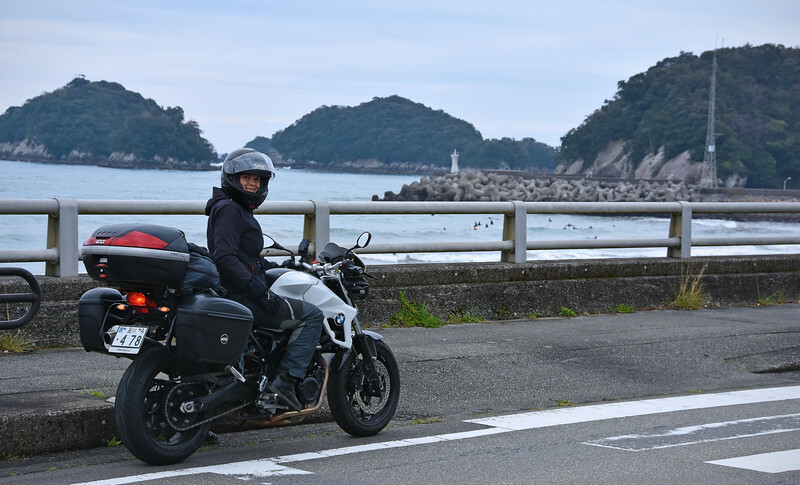 I guess it shouldn't have been a surprise that there is surfing here in Shikoku with all the tsunamis and typhoons that hit the south-eastern shore of the island. 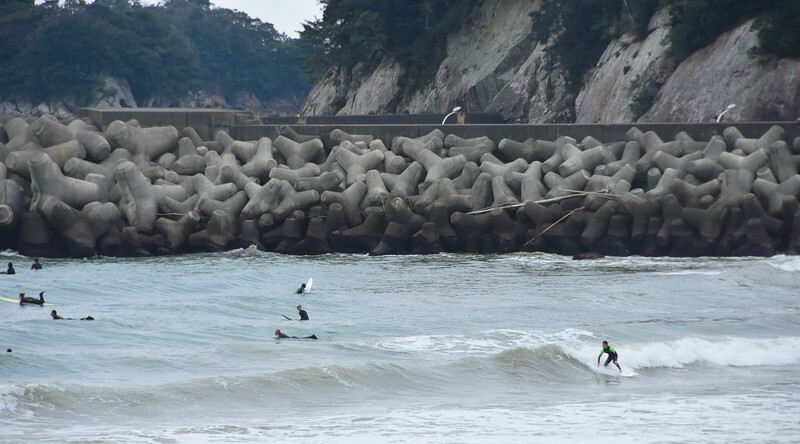 At first I thought these concrete blocks were a form of tsunami countermeasures, but then I read that these giant tiddlywink-shaped concrete blocks are called "Tetrapods". They're piled up on the beach to prevent erosion of the sand by the pounding waves. It's a very artificial design, not found in nature, its special shape forces the water to flow around them, dissipating the wave impact and preserving the sands beneath them from washing out into the ocean. 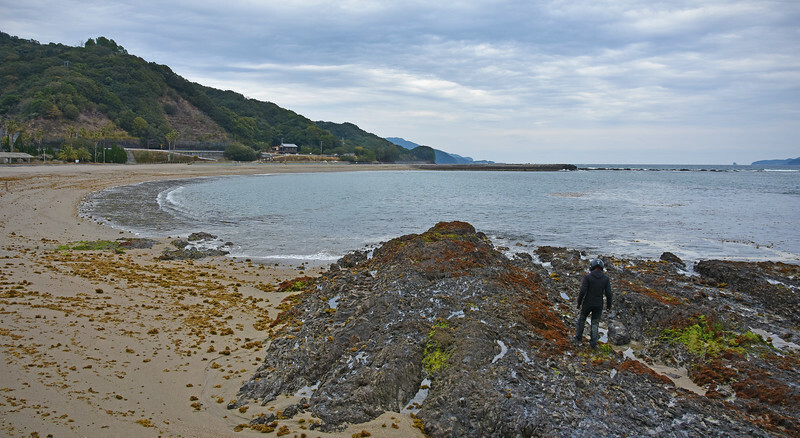 The south-east coast of Shikoku has a unique geography and climate contributing to excellent surf conditions. Because of the abundant rainfall, rivers from the mountains in the middle of the island create sandbanks on the shore when they spill out into the sea. 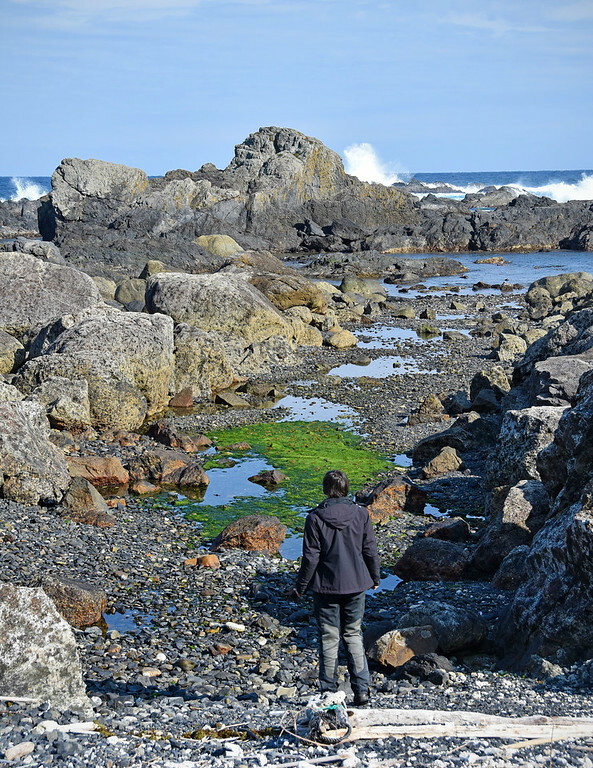 Then during typhoon season, the huge waves break on these sandbanks creating what's known as "rivermouth swells". 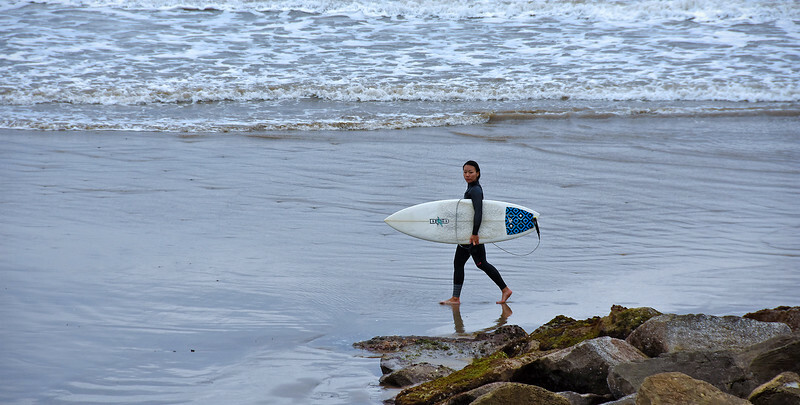 Typhoon season is normally July-November, which makes it the best time for surfing. It's still too early for the good swells, these must be all the locals in the area that surf year-round. 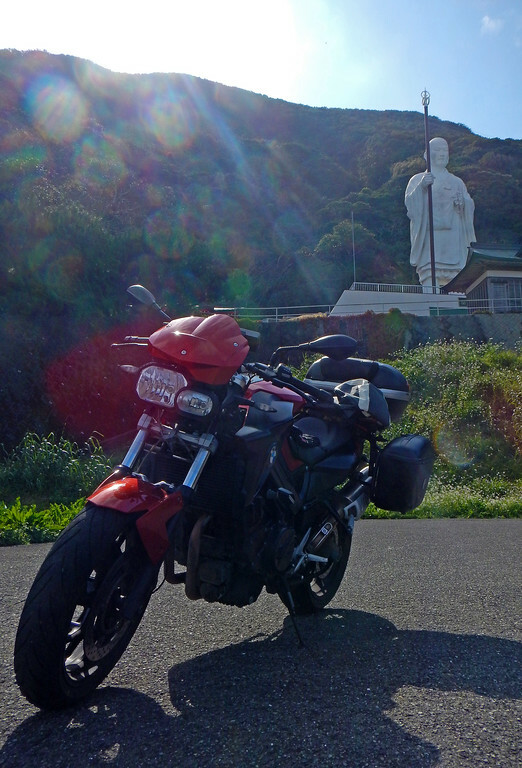 Parked beneath a statue of Kukai, the Buddhist monk at the center of the Shikoku 88 Pilgrimage. Beneath the statue is a temple where they train new priests. 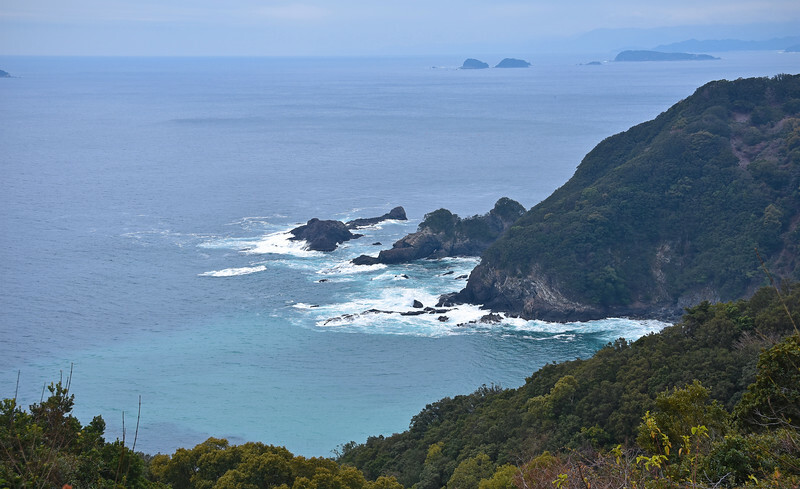 By the time we've reached the tip of Cape Muroto, it's well past lunchtime. 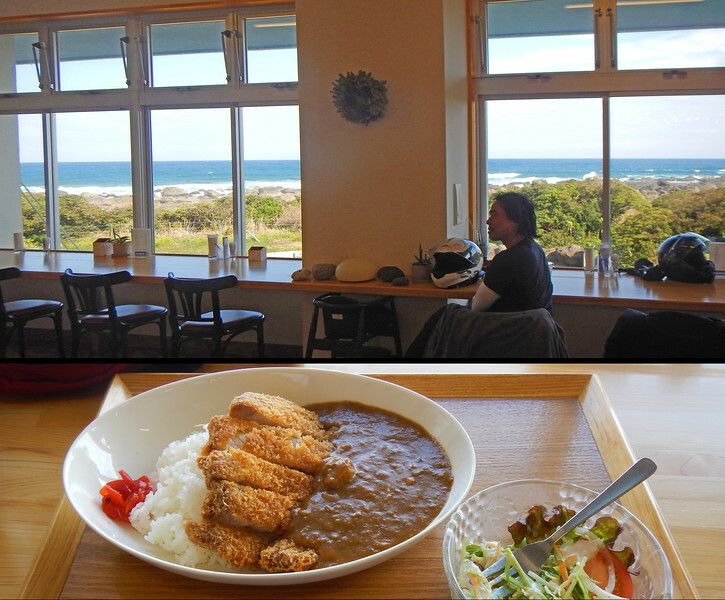 There's a visitor centre off the road and when we peer inside, we find a cafeteria with a marvelous view of the coastline. Score! We're lucky they are still serving food this late in the afternoon. We order the classic chicken donkatsu (breaded chicken with curry and rice). So Japanese!!! 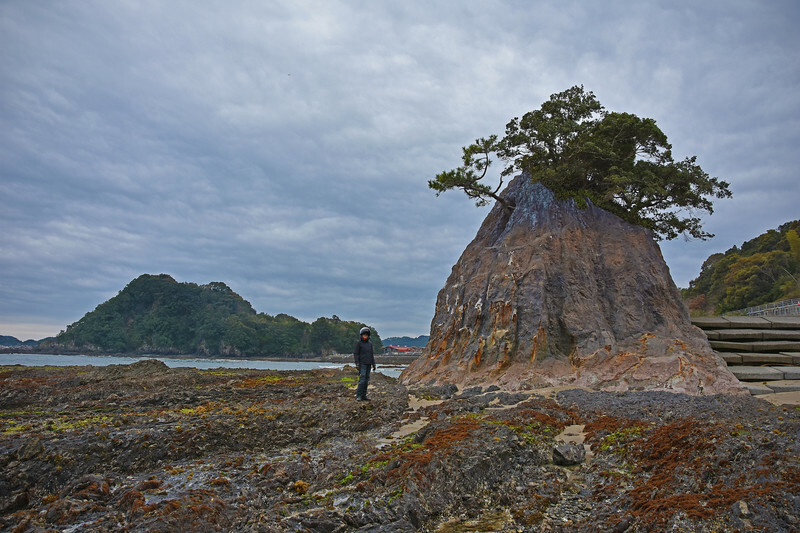 We love the isolation of Shikoku! What a peaceful, laid back island, especially when compared to Honshu. Pilgrims hiking along the side of the road, surf bums out on the beach, virtually no traffic on the road... perfect!